One of the most vexing problems confronting new thru-hikers is trying to estimate how far you are going to be able to hike each day. Whether you are young, slim, and fit – and as speedy as those attributes might suggest – or walk at a more serene pace, it’s good to know during your planning how much distance you can reasonably expect to put between projected campsites. This is not an exact science, but here are three tips and techniques that will increase your likelihood for success. First, if you are asking the question (How far can I expect to hike each day? ), then you are already doing something very right. Too many hikers instead ask this question: how many days can I get off? They then take that number, divide it into the 222 miles (which includes the trek down to Whitney Portal), and set the result of that division problem as their daily goal. As I say in the book: One of the keys to success on the hike will be to walk at your own pace. This is no time to try to force the large, square peg of your hiking speed into the small, round hole of the time you can spare. Second, start collecting some data on your training hikes – particularly the ones you do with the same pack weight as you will likely have at the beginning of the hike. Purposely include some flat hikes so that you can get a feel for your average miles-per-hour over flat terrain. On your hikes that include hills, use a fitness tracker, smartphone app, or map application on your desktop computer to track how much you ascend during the training hike. Last, try to lean a bit conservative when you make your calculations. It is much better to pull into a campsite early, or to have the time and energy to walk a mile or two farther (particularly if a mountain pass ascent is planned for the next day), than to be dragging into your projected campsite after dark, or to add a mile or two to the next day’s mileage. I am not fast. For every 100 JMT hikers, I would estimate that 70 are probably walking faster than I do. Based on my data-collection over the years, I use this formula: 27 minutes per mile plus 32 minutes per 1,000 feet of elevation climb. For example, on day 7 of a recent JMT hike, on a day that began at Purple Lake and ended near the Mono Creek Bridge, I estimated that I would be hiking 14.4 miles and gaining 2,682 feet (on that day I would go over Silver Pass). Using the formula I described earlier in this paragraph, my hiking-time estimate was 7.9 hours. My actual time was closer to 7.2 hours, but that is close enough – and is a reflection of my tendency to estimate things conservatively. A couple of last things. 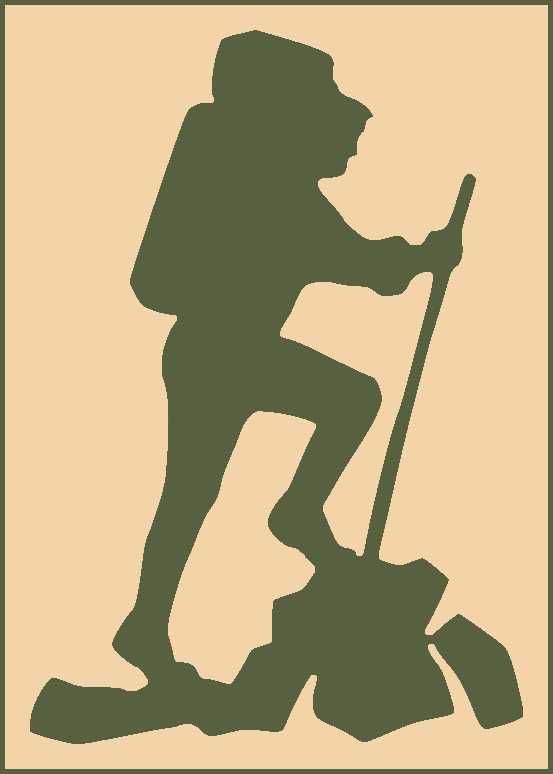 I don’t have an estimate for downhill hiking. That is just a level of complexity that isn’t worth the trouble, and comports with my conservative approach. Also, if you are handy with Excel or Numbers, calculating hiking time with the kind of formula I describe above is easy. First, I start early. Getting a couple of miles behind me before breakfast really sets me up for success. Second, I take a long lunch break. With lots of water, a good meal, and perhaps even a nap, a fourteen-mile day can become two, short, seven-miles hikes. Last, I purposely avoid pulling into the campsite too early. For me, arriving about two hours before sunset is just about perfect. That gives me time to set-up camp, eat, do some visiting with other hikers, write, and read. By that time I am ready for some sleep, and falling asleep as the sky darkens is always easier. Hey Ray. Nice article and good way to calculate time needed to hike a particular day. I’ve always used a minute per mile formula but not used a minute per 1000 feet climb ( I just add tncrease min/mile if lots of climbing ). Could you please confirm your 27 minute mile plus addition for climbing does not include lunch break or other longer type breaks ( i.e. Time to soak feet in a nice creek! ). Thanks for the comment, Mick. My calculations are for walking only. I like nice, long breaks and lunches. I have to add a couple of hours (or more) for those. Thanks for the comment, Hamish. That’s why I like keeping my estimate conservative. I don’t mind arriving at camp early or taking long lunches and breaks to ensure I don’t don’t finish early.